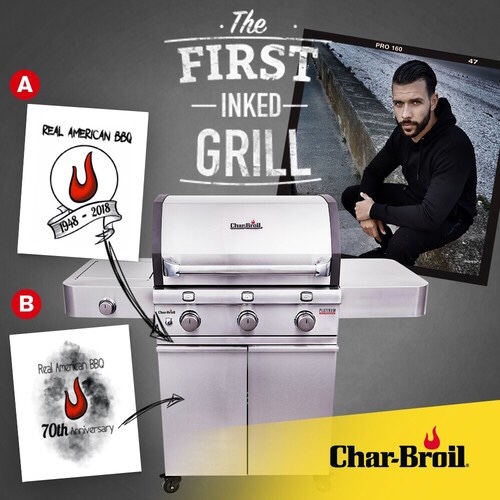 To mark the company’s 70th anniversary, America’s #1 gas grill brand Char-Broil® has inked a deal with leading UK tattoo artist Jay Hutton – who has been a star on E4’s Tattoo Fixers TV show for four years. Jay has been commissioned to design a tattoo that will be engraved onto a Limited Edition top-of-the-range Char-Broil Platinum BBQ, which can be won by two people via competitions running on Char-Broil’s UK Facebook page and on The Everyday Man blog. Winners will also receive time at Jay Hutton’s Adrenaline Tattoo Studio to have a tattoo of their choice. Jay has designed two exclusive images for the promotion. Fans of Char-Broil and Jay will be able to vote on which design they like the most to get a chance of winning one of these exclusive Platinum BBQs, worth £1,200. The winners will also get up to four hours each at Jay’s Adrenaline Tattoo Studio in Cheshire – one of the leading studios in the UK – to be inked with their own choice of tattoo design* in a session worth £600. To vote, entrants simply visit Char-Broil’s Facebook page: www.facebook.com/charbroil/ or The Everyday Man blog http://theeverydayman.co.uk/ and nominate the design they prefer. By voting, they are automatically entered into the prize draw. Voting runs from Monday 7th May to Thursday May 31st 2018. One winner will be picked from each of the voting channels. The two winners will be announced on June 1st 2018. The competition will be supported by social media marketing and promoted via brand partners.